You have crossed the first step of choosing VPS hosting for your business. As discussed earlier, VPS uses technology to split that effective server we simply discussed into multiple virtual servers. Consider it this way: it is a hardware that functions like a number of different servers. The word private means exactly what it implies. A virtual server is allocated for your website so you don’t need to share RAM, CPU and other resources with other websites. It is also known as cloud hosting, cloud computing. Now is the time to choose the next VPS hosting decision: which operating system should you go for? Well, there are two kinds of operating systems, Windows and Linux and hosting on both the operating systems is different. Linux hosting is an open source operating system that gives software availability to anyone and also allows them to use and modify for free. Whereas, Windows hosting runs on Windows operating system developed by Microsoft. There are differences between the two operating system. Let us look at some points that differentiate the two. The most obvious difference between the two is cost. Since Windows is a commercial system which is owned by Microsoft, and Linux is an open source type which requires no licensing cost, Windows is expensive than Linux. Windows licensing fees is taking into consideration and their VPS servers are subjected to specialized tasks which come with higher price. If you have a limited budget, Linux VPS server is the perfect choice. 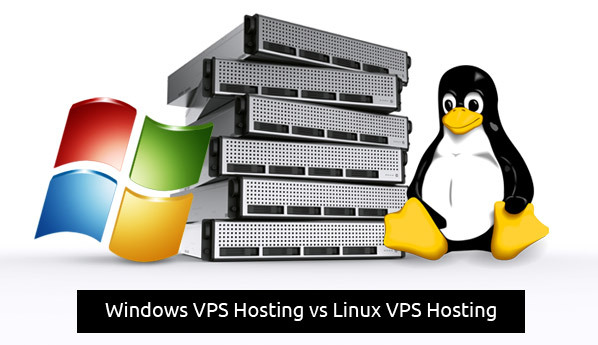 In general also, Linux VPS server is cheaper that Windows VPS server with same specifications. Windows VPS servers’ support .net technologies like ASP.NET, VB.NET, etc. If you develop your website in these technologies, you will want to dominate the powerful integration for these programming scripts. If you are going for open source options, you can use completely high technology, which Linux supports like Apache, MySQL or PHP. It also offers distribution options like Centos, Debian, Ubuntu, etc. 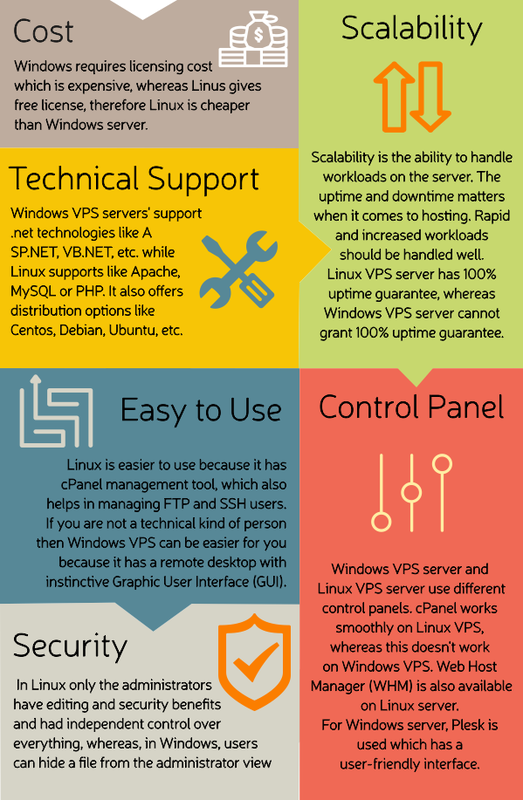 Windows VPS server and Linux VPS server use different control panels. cPanel works smoothly on Linux VPS, whereas this doesn’t work on Windows VPS. Web Host Manager (WHM) is also available on Linux server. For Windows server, Plesk is used which has a user-friendly interface. It depends if you are a technical savvy person or if you don’t understand technical things. Many with technical knowledge argue that Linux is easier to use because it had cPanel management tool, which also helps in managing FTP and SSH users. If you are not a technical kind of person then Windows VPS can be easier for you because it has a remote desktop with instinctive Graphic User Interface (GUI). Linux is based on UNIX operating system, which offers great security from malware, spyware and virus, environment, etc. compared to Windows. In Linux only the administrators have editing and security benefits and had independent control over everything, whereas, in Windows, users can hide a file from the administrator view. Scalability is the ability to handle workloads on the server. The uptime and downtime matters when it comes to hosting. Rapid and increased workloads should be handled well. In this case, Linux VPS server has 100% uptime guarantee, whereas Windows VPS server cannot grant 100% uptime guarantee. If your applications run on PERL, Ruby or Python, then Linux VPS server is the best for you, whereas if you work on ASP.net pr PHP then Windows is the preferred choice. Selecting an operating system is a tough choice since each of them have their own pros and cons. Choose an operating system for your VPS hosting wisely based on your individual choices, budget and environment.